You may go and play with it right away or stay here with me and get to know our thought process behind updating the tool. I think it might be quite interesting to you. Those of you, who’re just thinking of building their own tools will get some awesome advice from this article. And those, who already have that experience might give some awesome advice to myself. I’m always open for fair criticism! Is Reaching Out Really Effective These Days? Once the tool was released I thought it was quite a good idea to reach out to some well known bloggers and ask for their feedback. I created a spreadsheet to track my progress and honestly I wasn’t too satisfied with the response rate I got. So here’s a harsh reality: out of 100 bloggers that I’ve contacted with a personal email only 20 replied (yep, I honestly thought the blogosphere was more friendly than that). I’ve also posted a message on quite a few Internet Marketing forums and I want to say special thanks to guys from WickedFire, as their feedback was super valuable. “Hey Tim, yeah, nice tool!” or “Hey Tim, that’s not really cool. But you can add this and this to make it cool”. I know that everyone is busy, but it takes literally a few minutes to check the tool and write back, right? 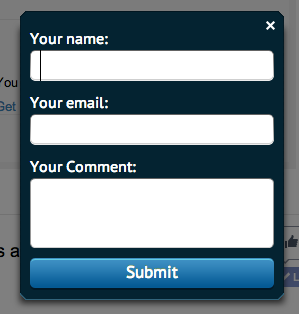 At the bottom of STB tool we have a link that says “leave your feedback”. And a few guys actually used it to report issues they were facing and give us a few suggestions on what the tool may be lacking. Thank you guys! Your feedback really helps and it’s greatly appreciated. We’ve also built our own analytics (quite simple though) to track what actions our visitors performed and if they eventually registered a free account or not. This also painted a picture of what we were doing wrong and what can be improved. So below is the list of issues that we were facing and that were fixed or improved in the current version of “Strip The Blog” tool. Once again, huge thanks for everyone who contributed! 1. The tool looked complicated to some people. Our analytics showed that only about 10% of all visitors were making at least one “strip”. That is super lame. I think for a simple tool like that, the number should be at least twice bigger. So we just got rid of this step and now to do the “strip” you only have to paste the blog URL and specify the timeframe. This sounds much more intuitive. Another thing we’ve noticed is that lots of the people didn’t understand what’s the value of knowing the popular posts of other blogs. 3. The powers of the tool weren’t showcased properly. Well.. we thought we made it obvious on our homepage that you should register a FREE account to get more powers, but lots of people just didn’t understand that. People thought that going two weeks back in time and checking tweets is everything our tool was capable of. So now we’ve changed that. So the tool is not limited in powers for unregistered users now. Like I said, our original reasoning behind making people register a free account was to unlock all the powers the tool had. But since people didn’t know about the additional powers, there was no motivation for them to register an account. And now we’re giving out all the features right from the start, so why should people bother to register an account? Well… you have all the features, but you can only use the tool 3 times as an unregistered user and that’s it. After you perform all three initial “strips” – the tool will get locked and suggest you to register a free account to continue using it. If we allow everyone to use the tool without limits, this will generate a high load on our server, which will make us pay a bigger fee to our hosting company. So why do we have to pay for you guys using our tool? Right now we’re not making any money with it as the tool is absolutely free for everyone. And until we start making money, we will have to limit its usage, so that to keep costs of running it as low as possible. I think that is absolutely fair. If you don’t agree to that – you’re welcome to share your opinion in comments. So right now unregistered users can only make 3 strips to get an understanding of what the tool is all about and that’s it. 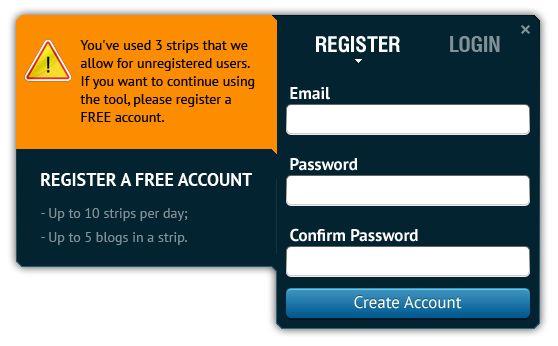 While registered users can make 5 strips each day (meaning once in 24 hours). But you guys requested to add Pinterest “pins” and comments numbers. Which we did! 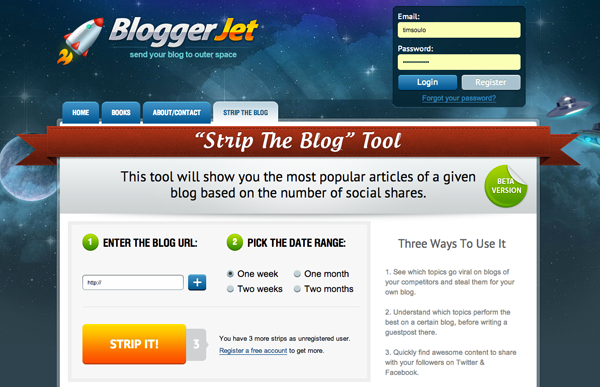 Now with “Strip The Blog” you can see which posts go viral on Pinterest and which ones generate buzz in comments. Once you know that, you can quite easily replicate this kind of success on your own blog! Actually, this feature existed in the previous version, but I guess many people didn’t know about it, because it was poorly designed. So as you may’ve noticed, once you do a strip, all the posts are sorted by popularity by default. Where the “popularity” is the sum of all numbers on all social sharing buttons of a post. And if you exclude a certain column, by clicking on the icon of a social network, the rows will rearrange, as the numbers from the turned off column are no longer calculated. Or you may want to sort posts just by the number of comments – in this case just turn off all other columns and that’s it! So how do you upgrade from “Free Basic” to “Free Advanced”? All you have to do, is share the tool on Twitter, Facebook or Google+. And that’s it! 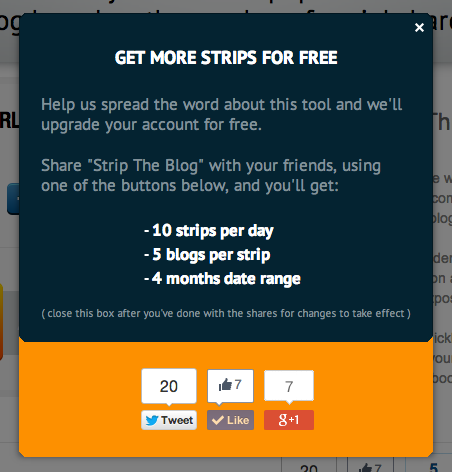 You help us spread the word about Strip The Blog and we give you more perks! Fair enough? We did quite a job in upgrading STB tool, and yet we didn’t cover even half of the ideas we have. So in 2014 we’ll keep updating the tool with new awesome features that every blogger would enjoy. And btw, all registered users will receive email updates once we add more features. All registered users will receive huge discounts once we create a premium version of Strip The Blog with some very amazing features. So if you’re not yet a registered user – you’re missing out! Now, once the tool was upgraded, I’m going to reach out to everyone once again, letting them know about this and asking for more feedback/advice. But you guys can actually give your feedback right in the comments of this article. Feel free to express your honest opinions and request features. As you can see, we really listen to you and improve our tool according to your suggestions. So what do you think? Do you enjoy our tool so far? Do you use it regularly to spy on your competitors? I’ve yet to get any posts from this tool. Tried several blogs, several niches, nothing. *shrugs* Oh well. Can you please specify which blogs you’ve checked and I’ll see what went wrong there. Trying to find a link to the tool. I can think of several ways to use it. Please help me locate an active link.